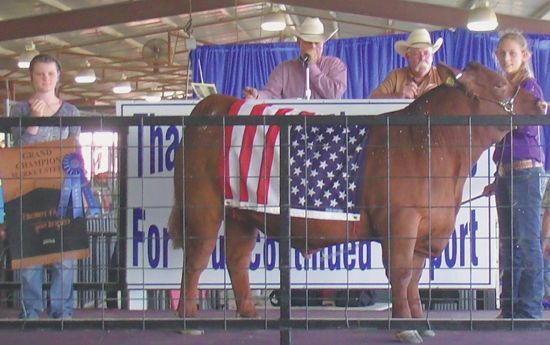 CROSBY  June 11 was the day that the Crosby Fair & Rodeo hosted the Annual Livestock Auction and this year sals and re-sales topped a new record. With a total over $24,000 more than last year the Rodeo Board can continue to boast of expansion while bestowing opportunity and cash to exhibitors. Over $50,000 came in Grand Champion Sales alone this year in the Crosby FFA & 4-H Auction and there were exhibitors out to third place that sold livestock. This year one of the flag bearing riders inside the arena during the rodeo was also the Grand Champion Steer Exhibitor, Meagan Nash. Meagan and her sister Madison have been thoughout Texas learning all there is to know about livestock. Gracie Shubert had the Grand Champion Lamb bought by Omnix Healthcare. Teague Schexnayder sold his Grand Champion Swine to Oilwell Tubular Consultants. On it went into the night as the community rallied about the concept of a Livestock Auction to provide educational opportunities to area youth that will work with the programs. Repeatedly, the efforts of the parents of these exhibitors in contribution to the community prosperity is most gratifying for those outside the events. CROSBY-HUFFMAN It looks like as early as 2019 drivers on FM 2100 can expect to move a little faster on two lanes in both directions. 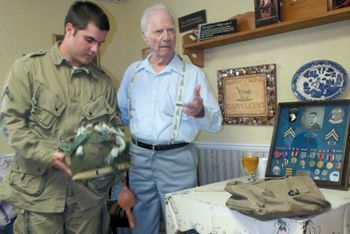 The Crosby-Huffman Chamber of Commerce had as guests last Thursday not only TXDoTs Quincy D. Allen, P.E. but also Jeremy Phillips, Senior Director of Infrastructure for Harris County Precinct 2 Commissioner Jack Morman. Along with them as guest, Dan Huberty R., District 127 Texas House of Representatives. 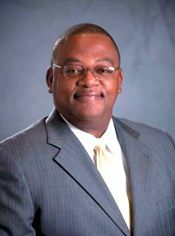 We are really picking up steam on FM 2100, Quincy Allen,Deputy District Engineer Houston District said. Allen was instrumental in the completion of U.S. 90 and helped move through the overpass of the Union Pacific railroad tracks in Crosby. Right now, we are looking at what our right-of-way needs are and well start the process of dividing right-of-way. Weve got to get an environmental study done to make sure were not disturbing the wetlands or vegetation that might be in danger but that process takes time and weve got that started, he said. This proposed project sought by the Crosby-Huffman Chamber of Commerce on FM 2100 is to make four lanes throughout the eight-mile stretch from FM 1960 to Hare Road. Costs should run about $60 million and is expected to be submitted to a project selection panel in August 2014. Allen suggested that Wayne Smith, R. 128th Texas House of Representatives, had been a prime mover of the project and often offered questions and suggestions engineer to engineer. Jeremy Phillips and I have been able to work together on several projects and Im here to tell you point blank that this is about the strongest partnership that I have had with Harris County in a certain area in a long time, said Allen. The question came up at the luncheon about the backup in Barrett Station. As covered in the April 24 issue of the Star-Courier, the $7.5 Million proposed project the county is doing to widen FM 2100 through Barrett Station hinges on TXDoT connecting to FM 1942 as a four lane south of the U.S. 90 overpass. When accomplished, the county can then begin to put in culverts in the ditches and widen the roadway through Barrett Station. Remember last February 8 when the Bras For the Cause was the social event of the year and the most fun had as most of us had with our clothes on? Well, that event culminated Saturday night, Tough Enough to Wear Pink night, with the presentation of two checks from the Tough Enough to Wear Pink Committee, headed by Debbie Holmelin raised about $120,000 that night and presented a check for $115,000 to the Pink Healers Foundation doing business at Methodist San Jacinto Hospital. 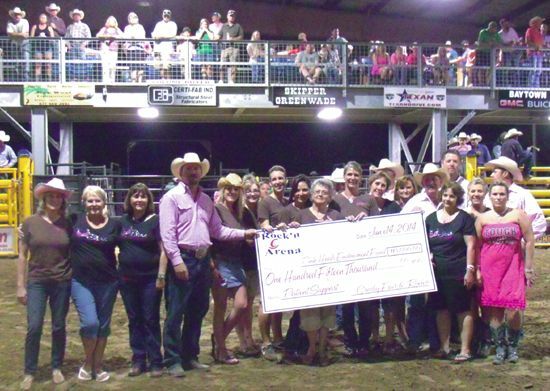 The Tough Enough to Wear Pink Committee of the Crosby Fair & Rodeo also presented a check for $10,000 to the American Cancer Society as will be seen on page 10. On hand right here in the Rockin C Arena last Saturday were Denise Martinez for Pink Heals and Kylie Vincent for the American Cencer Society. Her efforts are to provide for a patients living expenses as a patient pays for cancer treatment. The American Cancer Society helps fund research and contributes to finding a cure for cancer. New ownership, new dealership, new management that have many familiar faces will be found at Turner Chevrolet. Robert Turner, owner of John Keating Chevrolet and John Keating Subaru across the street from each other in Nederland, Texas has purchased the local Chevrolet dealership and says, We are people people. We are here in the community to try and do some good. We appreciate the support of the entire community. Apparently, that philosophy influenced his employing David Mendez for General Sales Manager. 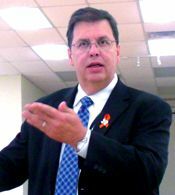 David is known for having been the General Manager at John Keating Chevrolet before the dealership was sold. Wed love for the community to come out, shake our hand and meet us. Mendez says. My vision is to give knock your socks off service, create a culture that sincerely takes care of the community. We want to earn your trust again and again. We cant wait to help you with all of your needs. I plan to be here for many more years. says Mendez that has shown his sincere love for Crosby and the surrounding communities by efforts like buying livestock at the Crosby Fair & Rodeo Livestock Auction with his own personal cash. His first e-mail address still is crosbychevyman@aol.com and he plans to keep it for life too. CROSBY  Its time to rodeo and it all begins with the largest party anywhere nearby, the Crosby Fair & Rodeo Cook-off at the Fairgrounds this weekend. The Cook-off is food, a parade, party and concerts Friday and Saturday nights. The fun begins on Friday night at about 5:00 p.m. when the gates open for the Cook-off party and concert. The concerts will begin each night after dark or about 8:30 p.m. Rides and a carnival atmosphere will be going on for the kids earlier and the cooking teams will be perparing delicious entries. Hill Country Jane plays first for the Cook-off on June 6. The band leads for Johnny Looking for Love Lee. Since 2005, Hill Country Jane has been steadily gaining momentum in the Texas/Red Dirt Music scene. Starting out as an acoustic trio in Austin, and now based in their native northeast Harris County, Hill Country Jane has evolved into a Texas Country Rockin Blues powerhouse. In 2012 HCJ joining forces with long-time friends and collaborators Chip Oliphant, Dan Payne & Derek Wilson from the local Houston band Last House on the Left. The 1980 top single, with Lookin for Love, has been the signature song for Johnny Lee. That fantastic hit not only spent three weeks at the top of the Billboard country singles chart in the second half of 1980 but also went to the Top 5 on the Pop charts, and Top 10 on Billboards Adult Contemporary survey. He racked up a series of country hits in the early and mid-80s. Johnny Lee, born John Lee Ham on July 3, 1946 in Alta Loma, Texas plays here Friday night. Since 1976 he has been making hits with the vocals that Americans love. He first became spotlighted with the movie Urban Cowboy after having worked with Mickey Giley for 10 years in Pasadena. To this day at every local cook-out someone will break out Cherokee Fiddle. and play it for the whiskey. Lee had five songs reach the top of the Billboard magazine Hot Country Singles chart. One in a Million (1980); Bet Your Heart on Me (1981); The Yellow Rose (1984, a duet with Lane Brody and the theme song to the NBC TV-series of the same name); and You Could Have Heard a Heartbreak (1984). Major hits that are still being played are Pickin Up Strangers (1981), Prisoner of Hope (1981); Sounds Like Love and Hey Bartender (1983); and Rollin Lonely and Save the Last Chance (1985). He still plays with the Urban Cowboy Band. His cookbook Chef Boy R Lee was a splash in 2006 and the website for the Texas Country Music Hall of Famer is www.johnnyleefanclub.com. The following night, Saturday, June 7, the concert will headline Jason Boland and the Stragglers. A Central Texas lad that went off to Stillwater, Oklahoma to the Oklahoma State University with plans on going to the Seminary. He went to the OSU Fraternity instead and dropped out to become a musician in two years. Texas born and bred singer, songwriter Abbi Walker Petkoff has been dubbed a Rockabilly songstress sort of a cross between Adele and Miranda Lambert. She will lead for Jason Boland and the Stragglers on Saturday, June 7, doubtless with songs her new single Kiss Kiss Bang Bang. Daughter of a preacher, singing since she was 3 years old, shes in love with not just singing, but songwriting and learning how to tell her story. Her songs are relatable. Abbis sound has many layers. Her fresh feisty lyrics hold deep Gospel soul and sweet harmonies mixed with gritty Southern Rock. The City of Baytown has issued a Permit to Close Public Way for a partial roadway closure of Bayway Drive on Tuesday, June 10, through Wednesday, June 11. The closures will take place from 6:30 a.m.  5 p.m., to allow for inspection of piping and installation of a new pipeline over Bayway Drive. The worksite is located approximately 100 yards east of the ExxonMobil south security gate. Motorists are asked to find alternate routes if possible and to obey all traffic signs and signals.